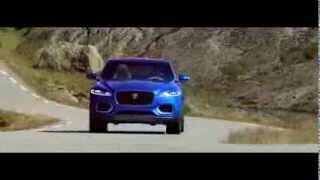 Jaguar's first ever sports crossover concept vehicle - the C-X17 - has premiered at the 2013 Dubai Motor Show. 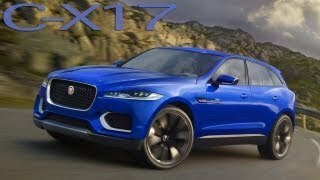 The 2013 Jaguar C-X17 Concept comes with Jaguar's all-new advanced aluminium monocoque architecture, on which an exciting range of future Jaguars will be built. The vehicle has been painted in a lustrous Liquid aluminium liquid metal finish, which looks as good as the C-X17's original blue paint. It blends sleek lines, sporting design and luxurious sophistication with enhanced flexibility and an assured driving position. The interior of the C-X17 features four individual bucket seats and the unique roof features contoured vanes. Two additional rear-mounted leisure seats incorporated in the boot floor swing out for recreational use. The interior of the C-X17 marries premium, authentic materials and traditional craftsmanship with modern finishing techniques. Power will be provided by a range of engines including the new family of high-output, fuel-efficient petrol and diesel engines to be built at Jaguar Land Rover's new UK engine manufacturing facility. These will enable Jaguar to offer vehicles with class-leading performance, including top speeds of over 300km/h (186mph), and emissions lower than 100g of CO2 per km.